Every generation has a few truly exceptional minds, and when Stephen Hawking passed away in 2018, the world lost one of the few people who probably could have thought of a way out of the mess we've made of the world. But, he may have left us one last gift. Just a few weeks before he died, he released a paper called "A Smooth Exit From Eternal Inflation?" and it's a strangely beautiful look at how he believed the universe began, grew, and will finally end. It's abstract and complicated stuff that most scientists don't even understand, notes Discover, and dissecting what it's all about isn't easy. So, let's talk basics and say this: Stephen Hawking — and paper co-author Thomas Hertog — essentially speculate the end of the universe will be something of a relatively smooth transition into the after, and cosmologist Andrei Linde translated a bit of the heaviest stuff for Gizmodo. "They argue that the end of eternal inflation (the expansion of the universe) may occur in a smooth way, and the variety of the possible outcomes is limited." That's … vague, and a sort of anti-climactic end to the universe, but there's a good chance no one on Earth will be around to see it. When it comes to the end of our own world, Hawking made some incredibly dire predictions about it. When Wired asked him about the relentless march toward developing artificial intelligence, he warned it might mean the end of mankind. "The genie is out of the bottle. We … need to be mindful of its very real dangers. I fear that AI may replace humans altogether. … Someone will design AI that replicates itself. This will be a new form of life that will outperform humans." Speaking at a summit in Portugal in 2017 (via CNBC), he warned the rise of AI had the potential to be "the worst event in the history of our civilization." He foresaw not just autonomous robots but autonomous weapons, too, and when one of the most brilliant minds in the world warns science fiction might become science fact, the rest of the species should probably listen. He's also suggested we're in danger of destroying ourselves before we even get that far, and in 2017, he talked to the BBC about how we're doing it. A huge part of our mistakes involve climate change, and he cited Trump's withdrawal from the Paris Agreement as particularly worrying. "We are close to the tipping point where global warming becomes irreversible," he told them. "Trump's action could push Earth over the brink … and [by] pulling out of the Paris climate agreement, Donald Trump will cause unavoidable environmental damage to our beautiful planet, endangering the natural world for us and our children." Hawking is absolutely not kidding around, and when he spoke at the Starmus IV Festival in 2017 (via Wired), he stressed how important it was that we find a way to colonize other planets if we want the human race to survive. In 2016, Hawking predicting (via Science Alert) that mankind had only about 1,000 years before the planet became incapable of supporting human life, and we needed to find a new place to live, pretty pronto. At the time, he was optimistic that mankind would get their act together, but by 2017, he revised his time frame to a mere 100 years. Some might be able to agree it was a rough year, but that rough? Stephen Hawking also made some other comments in 2017 that got almost just as much attention. GeekWire reported it was at the Tencent WE Summit he predicted overpopulation and the subsequent energy consumption were going to get to an unsustainable point in just 600 years … give or take. Overpopulation, climate change, energy consumption, artificial intelligence leading to a major war against machines … those are all things humans are doing to ruin the planet, but Hawking has also said there's the chance the end of the world is going to come from something well beyond the control of any human. 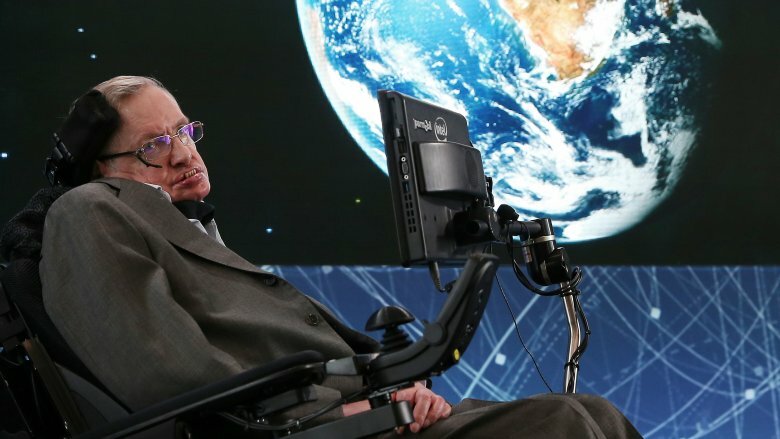 During his talk at the BBC's 2016 Reith Lectures, Stephen Hawking warned, "Although the chance of a disaster to planet Earth in a given year may be quite low, it adds up over time and becomes a near certainty in the next thousand or ten thousand years."